Here is a sight that you don't see everyday! I took this picture just a few hours ago, while giving a tour of Epcot. This is the busiest day of the year at Walt Disney World and Epcot is by far the busiest park. On this day, they open up the grass areas for guests to enjoy Illuminations. They do Illuminations twice tonight.....once at 6:30 and again to bring in the new year. It was certainly a fun atmosphere, but some of the wait times hit five hours today! Happy New Year! The Wilderness Lodge has one of the most impressive lobbies of any Disney World resort. However, during the holiday season, it is even better. The theming of this hotel takes you out of Central Florida and into the Pacific Northwest. With the giant Christmas tree, the fireplace and the numerous decorations, you can't help but be in a festive mood when walking around this lobby. The Voices of Liberty are by far one of the most talented performing groups in all of Walt Disney World. They entertain guests who are waiting for the American Adventure in Epcot to start. This a-cappella group typically sings patriotic songs throughout most of the year. However, during the holiday season, they perform Christmas carols. I snapped this shot yesterday afternoon, while my touring guests were enjoying the American Adventure. This is a group that is not to be missed, no matter what time of year you are visiting Epcot! The Land Is the largest pavilion at Epcot at over 6 acres in size. Today, however, it seemed like every inch of this building was filled with people. There was a steady stream of guests waking down towards Soarin', which had wait times approaching four hours today. The FastPasses were gone shortly after noon, as were the ones for both Test Track and Mission Space. During this busy time of year, it sure pays to use a tour guide. My guests had a great day and didn't have to wait longer than 15 minutes in any line. The mass of humanity that you see in this shot can be seen on a daily basis until the second week in January. At that point, the lines for Soarin' should be back down to 90 minutes or so! For most of the holiday season, Mickey's Once Upon a Christmastime parade is typically reserved for guests attending Mickey's Very Merry Christmas party. However, during Christmas week, you can see it as part of your regular admission to the Magic Kingdom. This is similar to the Holiday Wishes Fireworks show. I was standing in Frontierland today when I snapped this shot of Mickey and Minnie in their holiday attire. This shot is of the "ticket booth" on the second floor of the Main Street Railroad Station in the Magic Kingdom. During this time of year, you will find very traditional Christmas decorations throughout this area of the park. If I turned around 180 degrees, I'd be looking right down Main Street, USA at Cinderella Castle. This is one of the best spots to see the parades as well as the fireworks shows. Merry Christmas! Each Disney park does a great job of decorating for the holidays. However, Hollywood Studios takes the cake with their Osborne Family Spectacle of Dancing Lights. I've previously posted a photo and video from this years event, but thought this shot was appropriate for Christmas Eve. This gigantic Christmas tree of lights can be found toward the middle of the New York City Street. If you look right at the center of the tree, you will see a colorful hidden Mickey. Merry Christmas! Earlier this month, I had the opportunity to see the Candlelight Processional at Epcot. This amazing telling of the Christmas story includes a celebrity narrator, 50 musicians, and over 250 singers. On this night, James Denton (of Desperate Housewives fame) was the narrator. If you are visiting Walt Disney World at any time between Thanksgiving and New Years, this is a show that should not be missed! This video is brought to you by WDWGuidedTours.com. On this night before Christmas Eve, it is time to post another picture highlighting the decorations found at Walt Disney World. I took the picture of this toy soldier during Thanksgiving week at the Magic Kingdom. The Town Square area of Main Street is beautifully decorated and walking around here really puts you into the Christmas mood. A few days after I snapped this shot, Disney put up their huge Magic Kingdom Christmas tree close to this spot. These decorations can be enjoyed for about six weeks each year. With Christmas day quickly approaching, it is time to focus on the holiday decorations found all around the Walt Disney World Resort. This is the tree at the entrance of Animal Kingdom. It is unique in that it is primarily decorated with large, animal head ornaments. The Animal Kingdom and Hollywood Studios' trees are located outside of the park entrance. You have to be inside both Magic Kingdom and Epcot to get a glimpse of their trees. Audio animatronics have come a long way since they were first introduced in Disneyland's Enchanted Tiki Room in 1963. The latest technology allows for an incredibly lifelike fluidness that can be seen in several characters in the New Fantasyland section of the Magic Kingdom. Ursula, the Sea Witch, is one of these examples that had me in awe when I first saw her in the Journey of the Little Mermaid. She is definitely the highlight of that attraction! I snapped this shot while giving a Magic Kingdom tour back around Thanksgiving. This large bathtub shaped tomb is part of the new interactive queue of the Haunted Mansion. Every so often you hear sounds and see bubbles coming from this area. It also contains a fun little "hidden Mickey" (made of barnacles) between the first and last name of the captain. If you look closely, you can see it just below and between the letters "R" and "C."
This is one of my favorite views at the Magic Kingdom. When I took this shot back in October, I was standing at the center of the train platform looking out toward the Seven Seas Lagoon. You can see the entrance turnstiles for the Magic Kingdom as well as the monorail track at the center of the picture. The panorama feature of the iPhone creates a unique perspective of this "straight" piece of railroad track. The Move It! Shake It! Celebrate It! Street Party is a high energy parade that entertains guests at the Magic Kingdom several times of day. Full of beloved Disney and Pixar characters, the floats make their way up Main Street U.S.A. and park around the hub in front of Cinderella Castle. In addition to the characters, there is a party host and other cast members who interact with guests throughout the show. Kids and adults are able to dance to several different tunes, and there is even a conga line formed at one point. You can see Minnie and Dale in this shot. Mickey is typically found on the other end of this float. I recently posted a picture from the queue of the new Test Track, as well as a full "on-ride" video. Tonight, I am featuring a photo from the "post-show" area of the attraction. Prior to the ride, I designed this car and it was stored on a credit card sized piece of plastic. My design was judged against the other guests in my vehicle at four different spots on the ride. After exiting the ride portion, you walk into an area with many interactive exhibits. There are several large photo spots, like the one you see in this picture. You touch your "card" to a kiosk and your car design gets loaded. You then choose a background and enter your email address. 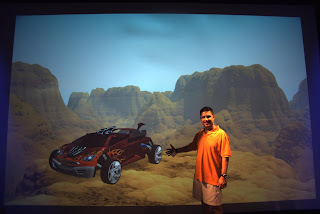 The next step is to stand in front of the large screen where your photo is taken with your car design. Within minutes, this picture was emailed to me and I was able to pull it up on my smartphone. This is an example of how Disney is constantly using new technology to enhance the theme park experience. Often times, while giving tours of the parks, I have to wait for my guests while they are enjoying an attraction. This is when I like to find unique photo opportunities. A few weeks ago, on Thanksgiving, I was in the area of the Universe of Energy. My guests were enjoying Ellen's Energy Adventure, which is a 45 minute attraction. Often times I'm running for the next FASTPASS or scoping out the lines, but since this was their last ride of the day, I had time to take some pictures. I took this shot of Mission Space from a "smoking" area in between Space and Energy. It was at a time of day when the sun lit up the attraction nicely. The trees and bushes in the foreground provided some nice contrast and also provide a natural frame for the subject. The area in front of the Great Movie Ride at Hollywood Studios has many celebrity handprints in the cement. The ride is housed in a replica of Hollywood's Chinese Theater, which is where the tradition of celebrity handprints originated. It is fun to walk around the courtyard at the entrance of this attraction to see what names you recognize. I am a fan of this Harry Anderson imprint. Not only does it contain a message to Mickey, but there is also a "hidden" Mickey on Harry's tie. As I've mentioned in several recent posts, Disney does a great job at decorating the parks for Christmas. The Emporium is the huge gift shop that lines the west side of Main Street, U.S.A. in the Magic Kingdom. It represents a time around the year 1900, and there are very traditional decorations throughout this location. You can find the scene depicted in this photo right near the entrance of the store that faces Town Square. Illuminations is one of the greatest night time shows you will ever see. During the holidays, however, it gets even better. After the normal show ends, there is an additional five minute "holiday tag." I had the opportunity to record it this past Sunday night, and I was moved by the experience. This tag consists of the song "Let There Be Peace on Earth," which is touching to begin with. However, since this was the song my grandma used to sing to me as a young boy, it was hard to contain my emotion. The finale of this special holiday edition is absolutely amazing, and the intensity of the fireworks is nearly overwhelming. Needless to say, if you are ever visiting Walt Disney World during the holiday season, Illuminations should be at the very top of your list! The "Fountain of Nations" sits behind Spaceship Earth in the Innoventions Plaza section of Epcot. This impressive display of dancing waters puts on a "show" every fifteen minutes. It is choreographed with several different musical scores, including pieces by Yanni, John Tesh, and even movie soundtracks. This fountain contains over 200,000 gallons and can shoot water up to 150 feet into the air. As part of Epcot's opening ceremony back in 1982, over 20 countries sent representatives to participate. Each one poured a gallon of water from their homeland into the fountain. In addition to the opening day ceremony, this "Pouring of the Waters" also took place at Epcot's 25th anniversary celebration. Although this area isn't open yet, guests can see Rapunzel's Tower (from the movie Tangled) at the end of Fantasyland. It is in the former spot of the old "Skyway" ride. I took this picture from just outside of the Haunted Mansion. I'm sure that Disney will be blocking this view off before long, as this tower should not be seen from Liberty Square. This isn't going to be a Rapunzel attraction, but actually an area with restrooms and phone charging stations. Disney incorporates a story into everything they do, whether it be an attraction, restaurant, or even restrooms. I was fortunate to be on the last ride of the old Test Track back on April 15th of this year. There is a highlight video of that ride on my YouTube channel. The new version of Test Track opened last week and I recorded the entire ride from the right-front seat. You can see how different this re-themed attraction is. Although the actual track layout is the same, it is an entirely different experience. There is no question that the Disney Imagineers were heavily influenced by "Tron" when they re-designed Test Track! On Sunday night, I finally had the opportunity to see Epcot's Candlelight Processional for the first time. Although this incredible production has been entertaining guests during the Christmas season since 1994, I never had the chance to see it. This 40 minute show takes place in the America Gardens Theater three times per night from Thanksgiving to December 30th. It is a moving presentation of the Christmas story featuring a celebrity narrator, a 50 piece orchestra, and a mass choir of about 250 singers. The center section consists of a select group of Disney cast members that form a green "Christmas tree." The base of the tree is made up of the amazing Voices of Liberty group, who normally perform inside the American Adventure. The rest of the mass choir is made up of high school and college choirs from all over the country. More than 20,000 amateur vocalists will perform in the mass choir during the five weeks of performances. The show that I saw was narrated by actor James Denton, known for his work on Desperate Housewives. After seeing the Candlelight Processional, I highly recommend making it a part of your Disney World vacation. I certainly plan on seeing it every year going forward. The Roy O. Disney steam engine is the oldest "attraction" in Walt Disney World. Built in 1916, it is just one year older than the Prince Charming Regal Carrousel in Fantasyland. I snapped this shot today on the path between Storybook Circus and Tomorrowland. While giving tours of the Magic Kingdom, I like to utilize this shortcut whenever possible. It is also the best place to get unobstructed photos of the Walt Disney World Railroad. I had the opportunity to ride the recently re-opened Test Track tonight. Disney did an incredible job at updating and re-theming this already popular attraction. It now has a "design" theme as opposed to the traditional testing theme of the prior version. Although it uses the same track layout, everything else about the ride is completely different. In the "pre-show" portion, guests design their own automobile using four different parameters. This is done on large, touchscreen kiosks. They are given a score based on their designs and each design is stored on a credit card style memory device. Each vehicle holds six passengers, and throughout the ride, each guest's scores are posted on digital boards. The ride takes place inside of a computer and has a very "Tron" inspired feel. It really feels like you are now experiencing an attraction that belongs in Epcot's Future World. This picture is of the car I designed on my first ride. You can see the four parameters that are used to design your vehicle on the left side of the picture. If you were a fan of the original Test Track, you should really love the new version. If you are also a Tron fan, this may very well be your new favorite attraction! The Walt Disney World resort transforms during this time of year. Each hotel and theme park is decorated to bring holiday cheer to the guests. For much of November and December you can find this giant Mickey head at the backside of Spaceship Earth. It is made of poinsettia plants and is similar in size to the one found at the entrance of the Magic Kingdom. The glass windows, behind the Mickey, are part of the Siemens hospitality suite. This is a VIP lounge used for executives of Spaceship Earth's sponsor. Prior to Siemens, AT&T claimed ownership of this area. The Carousel of Progress is one of my favorite Magic Kingdom attractions for many reasons. The primary one, however, is because this is an attraction that was developed and physically touched by Walt Disney himself. After debuting at the New York World's Fair in 1964, the attraction was moved to Disneyland, where it lived from 1967 to 1973. It was then transported to Walt Disney World and opened on January 15, 1975. This was the same day that Space Mountain debuted. I took this panorama of the final scene a few months ago, while giving a tour of the Magic Kingdom. You can see that it depicts a modern-day family celebrating Christmas. Each of the first three scenes features a different season and holiday, including Valentines Day, Independence Day, and Halloween. Although the Carousel of Progress isn't a "headliner," it is certainly worth seeing. There is almost never a wait, and it is truly a classic attraction. Today was a special day for Walt Disney World as it featured the grand opening (or reopening) of several attractions. The biggest took place this morning in the Magic Kingdom, as New Fantasyland was officially opened. There was a ceremony in front of Cinderella Castle that included several celebrities. The next grand opening featured The Legend of Jack Sparrow attraction over at Hollywood Studios. Finally, tonight Epcot hosted a grand "re-opening" party for the completely new version of Test Track. The party included a musical performance by One Republic. Although this picture of Test Track was from a few weeks back, I am very much looking forward to riding it this weekend. You can be sure I'll be taking a whole bunch of photos of this "new" attraction! Today would have been Walt Disney's 111th birthday. He was born on December 5th, 1901. I know most people don't live to the age of 111 (although my nana is 102 and still going strong), but it is hard to believe that he has been gone for nearly 46 years. It is sad that he "created" Disney World, but never actually had the opportunity to see it. However, there is little doubt that he would be proud of what this amazing place has become. His legacy will always live on in his theme parks. I took this photo of the "Partners" statue just a few weeks ago. It is at the very center of the Magic Kingdom, in front of Cinderella Castle. It was sculpted by Blaine Gibson and installed on June 19th, 1995 as a fitting tribute to a man who brought joy to so many people. With the grand opening of New Fantasyland only a few days away, I thought it was appropriate to post some more pictures from this area of the Magic Kingdom. This impressive entrance leads you directly into the Be Our Guest Restaurant. The large, mythical creatures on each side of the doors are "golions," part goat and part lion. Directly above the golions you will see "sneagles," a mix of snake and eagle. In addition to these interesting "animals," there are gargoyle like figures along the bridge that approaches the entrance. I recently learned that all of them are named Frank. I have yet to hear the story behind the name choice. Sleepy Hollow Refreshments is one of my favorite spots for a quick bite. It is in a great location, just over the bridge into Liberty Square and a short walk from Cinderella Castle. It is named for the village in the Washington Irving short story "The Legend of Sleepy Hollow." The building was inspired by Washington Irving's home, and 18th-century cottage in New York's Hudson Valley. It also fits in with the theming of Liberty Square's Haunted Mansion, as that also resembles 18th-century Hudson Valley architecture. Although the story is an important part of all Disney World areas, the best thing about this location is the food. It is known for its funnel cakes and waffle sandwiches. I am partial to the Nutella and Fruit Waffle. Even though I'm not a big fruit fan, the Nutella makes this one of my favorite treats in all of Walt Disney World! During Thanksgiving week, I had the chance to preview a new attraction that officially debuts on December 6th. It is called The Legend of Captain Jack Sparrow and it's located in Hollywood Studios near Toy Story Mania. It is in the in the former location of the old Chronicles of Narnia attraction. The Legend of Captain Jack Sparrow is a ten minute (somewhat interactive) show featuring some great special effects. Johnny Depp plays his role of Jack Sparrow and the projection technology that Disney uses makes it seem like he is right there in front of the audience. This picture of the pirate skull and swords is from the pre-show area. Although this isn't a headliner type of attraction like Soarin' or Space Mountain, it is certainly worth checking out.......especially if you are a fan of the Pirates of the Caribbean movies. This shot of the Tree of Life was taken on the path between Africa and Asia in Animal Kingdom. This angle gives you a clear view of the park's icon without having the large crowds in the picture. I was standing along the Discovery River looking across to Discovery Island. This is also the area where you can see DiVine, the woman who is completely camouflaged to look like part of the landscape. She entertains guests throughout the day in a very graceful and mysterious way.